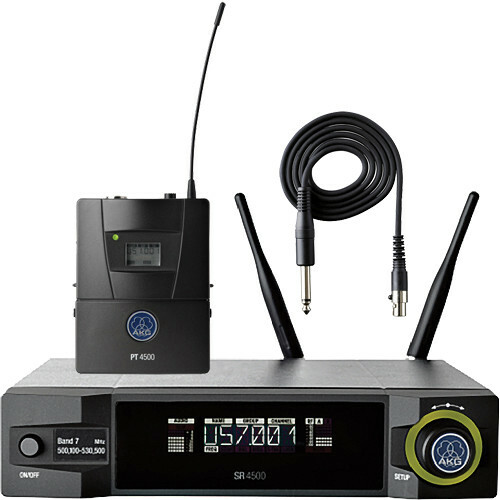 The BD8 570.1 to 600.5 MHz AKG WMS4500 Reference Instrument Set is a multichannel wireless microphone system providing high channel quantity, reliability, and easy setup. The instrument set includes a SR4500 Wireless Stationery Receiver that has a frequency of BD8 570.1 to 600.5 MHzz, 50mW of transmission power, and comes with a PT4500 Bodypack Transmitter. The package also contains a professional MKGL instrument cable to safely connect the transmitter with an electronic guitar, electronic bass, keyboard, and other electronic instruments. The system also includes a belt clip, 19"rack mount kit, LR6 batteries, and whip antennas. The sound quality and reliability of the system makes it suitable for both installations and touring applications. An optional network remote control allows frequency co-ordination and monitoring of multi-channel systems via PC software System Architect, Apple iPhone/iPad/iPod or via Soundcraft Vi consoles. The SR4500 Wireless Stationery Receiver provides maximum ease of use with an automatic setup function and scan of the radio frequency environment. The rehearsal mode supports the engineer during sound check with information on the system's signal quality. The programmable status monitor shows all relevant system information on an illuminated multicolor LED ring. The precise battery life readout in hours is a helpful when managing wireless applications. The PT4500 Transmitter is an analog reference wireless body-pack transmitter with high wireless audio quality for instrument and vocal use. The pilot tone prevents unexpected system startup noise, continuously sending transmitter data, including the mute switch position and remaining battery life, to the receiver. An RMS4000 external mute switch (sold separately) allows the user to mute the transmitter remotely. The transmitter offers a battery life of 15 hours with 2 standard AA-size alkaline batteries. With the integrated charging contacts, the BP4000 battery-pack (sold separately) can be charged inside the transmitter. The MKGL Instrument Cable features a mini XLR connector and 6.3mm (1/4") jack.